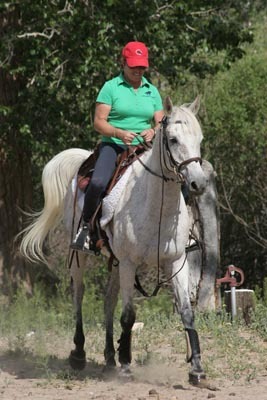 Two-time World Endurance Champion Valerie Kanavy pulled into the Teeter Rancho ("the boonies," Valerie chuckled) early Monday morning with two horses and two grooms after a cross country drive from Virginia. Both horses are half-qualified for the World Endurance Championships in Malaysia in November - they've each completed a 100-mile ride under 12 km/h (13 hr, 20 min ride time) - and she plans to try to get the second one under their girths on this trip. Originally she'd thought Steph was putting on an FEI 100-mile ride each day of the May 24-26 ride, and she was willing to ride a hundred on the first and third day (diehard! ), until Steph told her we had only 1 100-miler. 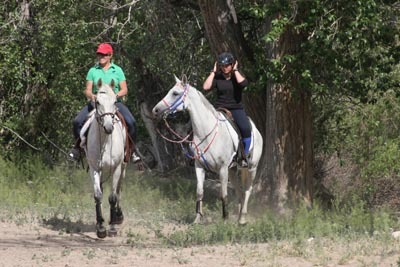 So after the Fandango, Valerie and her crew are heading to Fort Howes in Montana for the other hundred mile ride for her other horse two weeks later. She hasn't decided yet who she'll ride where. Valerie and her groom Laura Vilaregut - from Catalonia, Spain; last month she won the Junior Catalonian Championship - took the horses, King Ali Gold - who won the December 31 2007 New Years in New Mexico 100 miler, and Flash Flame - who won the 2005 Arabian Nights 100-mile ride here with Danielle Kanavy, out on a trail ride to get the kinks out after their long haul. After dropping their horse trailer full of goods off earlier last week, then heading to California for the weekend, Susan and John Favro of Healthy as a Horse returned and set up their trailer and mapped out their shop set-up, and John played his mandolin for us while I fed the horses that are now penned up. 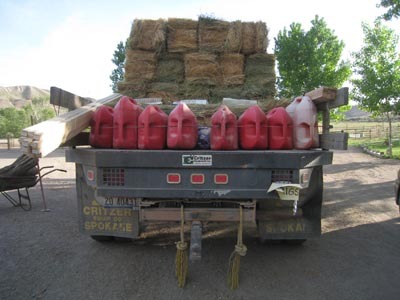 Ride manager Steph spent a long time on the phone finding a feed store that had hay for sale; John T went to pick up all their bales - only a small truckload, and a stock of gas for the 4-wheelers. 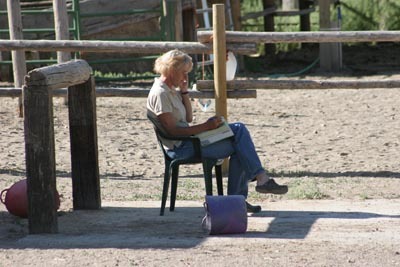 He also dragged the arena that will be used for the trot outs and set up the pens that some riders will use. Debbie and John Knapp of the Boise amateur radio club had already shown up over the weekend to mark off an area for their radio set-up to cover the ride. so basecamp is a green oasis in the high desert, awaiting the arrival of some serious endurance riders for the Memorial Day weekend. Thanks for your fantastic endurance coverage all over the world.